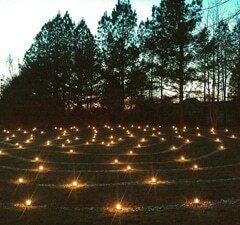 Sacred Grove Retreat Center, affectionately called “The Grove” is more than just a venue. It’s a spiritual experience. 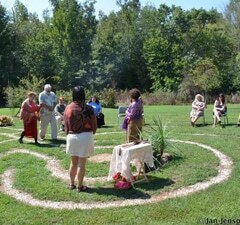 Sacred Grove is nestled in the Piedmont of North Carolina on 11 wooded acres. 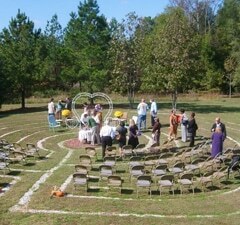 It is a small wedding venue with the option to choose this for indoor wedding venues in NC and for having a unique, intimate indoor wedding in one of our yurts or an outdoor wedding ceremony in the labyrinth. Surrounded by the best that nature has to offer, you can choose which unique location feels right for you. Either the labyrinth or the yurt are ideal spots to exchange vows and the gorgeous grounds provide a natural backdrop for your pictures and reception. After the ceremony, take a walk around our tranquil property or enjoy the peace and quiet sitting around the vortex or the firepit. One of the best aspects of Sacred Grove Retreat is the option to spend an entire weekend with family and friends. Our centerpiece, the Grove house, is perfect for wedding parties to spend time together, not only while preparing for the wedding day, but throughout the entire weekend. Sleeping 18 people, there is plenty of room for loved ones to enjoy a retreat of their own, while celebrating your special weekend. And while friends and family are together in the Grove house, the newlyweds can slip away to the Thoreau cabin for privacy and quiet. Love is love and a wedding is a wedding, but here at Sacred Grove Retreat, we understand that couples still face challenges when planning their special day and seeking out LGBT friendly wedding venues in North Carolina and we are here to help! 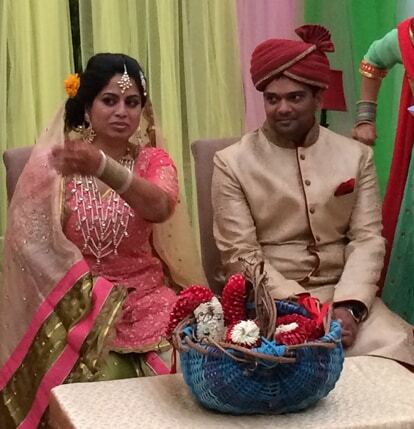 We are committed to providing an atmosphere of love and acceptance to all who exchange their vows here. Just 1 hour from Charlotte and 75 minutes from Winston-Salem, Greensboro, or High Point, Sacred Grove Retreat is a convenient Carolina wedding venues where you can surround yourself with friends and family to celebrate your special day. 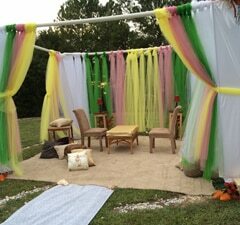 Create an unforgettable ceremony at wedding places in Charlotte NC - Sacred Grove Retreat Center that is sure to be as unique and beautiful as you are. This includes The Grove house with up to 16 guests, Grandmother Yurt, Vortex, Labryinth, Walking Trail and Fire Pit. This includes The Grove house with up to 16 guests, the Thoreau Cabin Grandmother Yurt, Vortex, Labryinth, Walking Trail and Fire Pit.